Is your classroom full of budding young scientists? 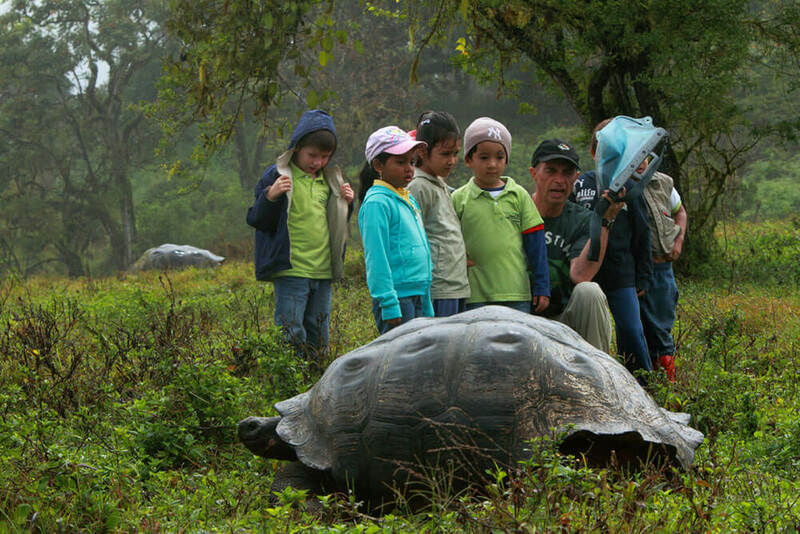 Would you like to explore the fascinating world of the Galapagos giant tortoise? Join our Tortoise Champion programme and become part of a network of conservation ambassadors helping to protect this iconic Galapagos species for just £35 per academic year! Hundreds of years ago, Galapagos giant tortoises were hunted for their meat and oil by whalers and buccaneers. Now, the giant tortoises continue to be under threat from the species introduced to those islands by humans all those years ago and some more recently. Rats, fire ants and pigs destroy their nests and predate on eggs and hatchling tortoises, cattle and horses trample their nests. As we work to protect these amazing reptiles, we have learnt so much about how critical they are to Galapagos and how essential it is to conserve their habitats. The Galapagos Conservation Trust, the driving force behind Discovering Galapagos, is supporting the Galapagos Tortoise Movement Ecology Programme (GTMEP) to improve our understanding of giant tortoise migration, egg and hatchling survival, and human-tortoise conflict so that more effective management plans can be implemented. 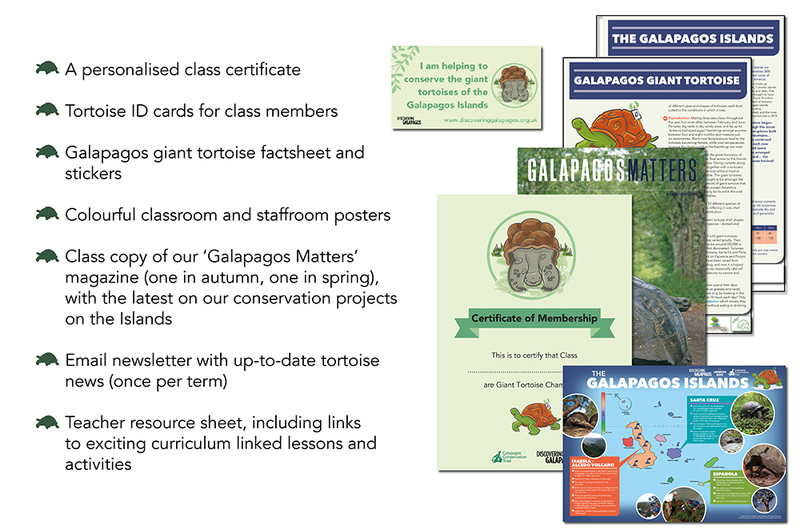 By becoming Tortoise Champions your Class will help in this journey of discovery and conservation, and in return you will receive a Resource Pack including updates on the latest news from our Galapagos giant tortoise projects! Teachers will also have access to fantastic list of curriculum-linked educational resources ranging from science, literacy, geography and numeracy activities to support your students learning about this iconic animal. Through this journey your students will get to know the tortoises and their habitat, the threats they face and the efforts to conserve them. 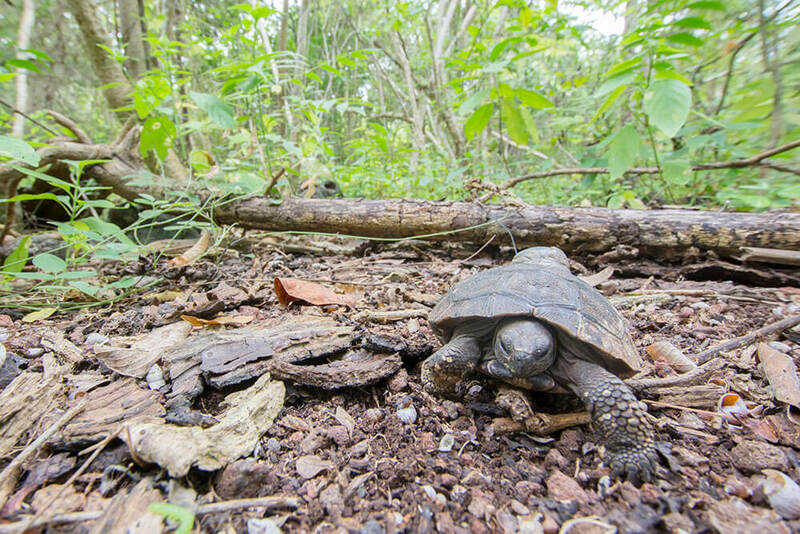 They will learn how scientists are tracking tortoises in Galapagos Islands and how the data collected are helping scientists obtain a better understanding of the tortoises and their behaviour. Last but not least, you will have the exclusive opportunity to participate in our annual schools competition, which launches in the autumn term. Please note – the 2018/19 competition is now closed for entries! 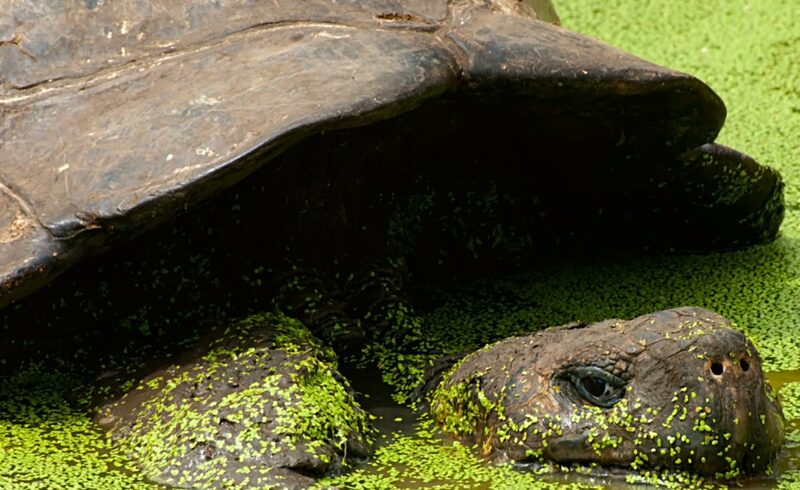 Your Class’ donation will help towards continuing conservation efforts to restore and protect tortoise populations across the Galapagos Archipelago. Find out more below. Tortoise Champions memberships run to the end of an academic year (31st August), and will be available to renew from the 1st September each year. You can sign up your Class as Tortoise Champions at any point during the academic year, and we will send you any newsletters and magazines already sent out during the current sponsorship period so you don’t miss out! Ready to join? Sign up using the link below! Alternatively, you can pay on the phone or you can send us a cheque in the post. To make a postal payment please print and complete our payment and contact form to send in with your cheque.